TEL AVIV – Satellite images from Saturday’s U.S.-led joint military operation in Syria show extensive damage to three chemical weapons facilities in the war-torn country. The photos, released by an Israeli imaging company, show a research site at Barzah overlooking Damascus as well as two weapons storage facilities in Homs. The U.S. said that in addition to research, the Barzah facility was used as a center for the development and testing of both chemical and biological weapons. 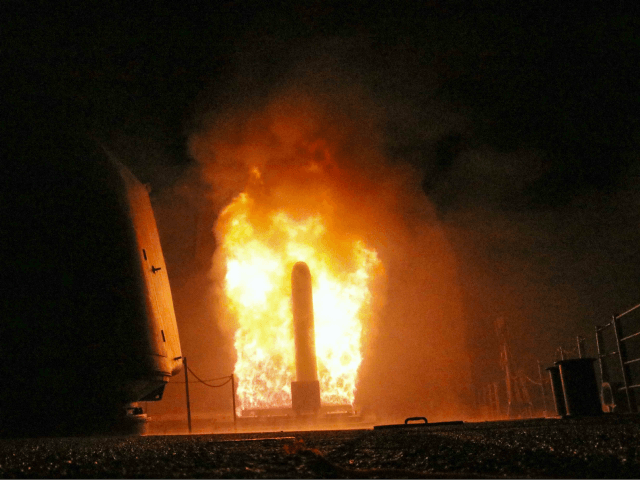 In a joint operation with the UK and France, chemical weapons sites, including a storage facility and a research base, were targeted in the pre-dawn hours, constituting the largest military intervention so far since the civil war began. The military assault was a response to the chemical gas attack on the Syrian town of Douma last week in which 42 people reportedly died and many others, according to images and video, were left gasping for breath and foaming at the mouth. 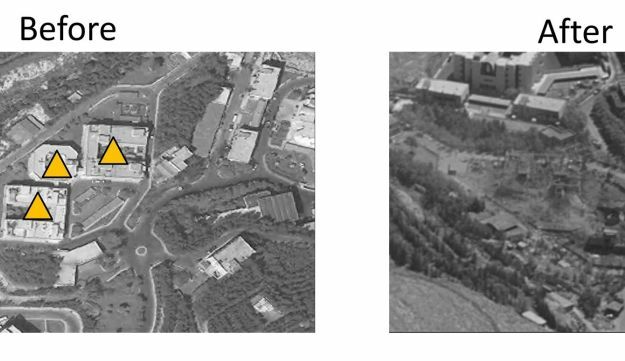 The satellite images show three buildings at Barzah completely destroyed. 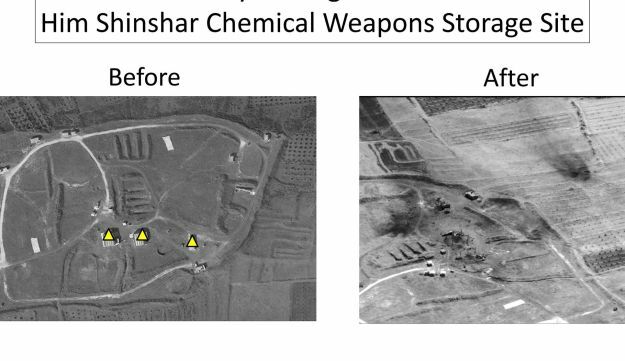 The chemical weapons facility in Barzah, before and after (AP). “The three facilities are — or more appropriately, were — the fundamental components of the regime’s chemical weapons warfare infrastructure,” Lt. Gen. Kenneth F. McKenzie, the Pentagon’s Joint Staff director, was quoted as saying by the New York Times. 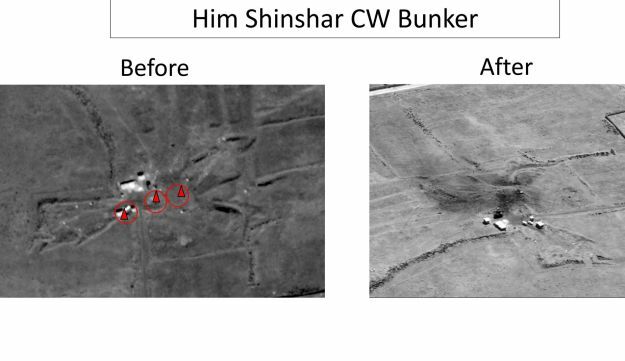 Him Shinshar chemical weapons bunker in Homs (AP). Him Shinshar chemical weapons storage site in Homs (AP). Russia denied the U.S.’s assessment, saying that Syrian air defense systems intercepted 71 out of 103 cruise missiles. Syria also said the strikes failed to impact the targets in Homs, but the images show extensive damage. Trump announced the joint operation on Friday, saying it was a direct response to the toxic gas atttack. “The evil and the despicable attack left mothers and fathers, infants and children thrashing in pain and gasping for air. These are not the actions of a man. They are crimes of a monster instead,” Trump said. U.S. Defense Secretary Jim Mattis said the strikes were a “one-time shot” and that there was no additional action planned for the immediate future. Gen. Joseph Dunford, chairman of the Joint Chiefs of Staff, also confirmed that there were no further strikes in the pipeline. Trump praised the strikes, saying he could not have wished for a better outcome. “A perfectly executed strike last night. Thank you to France and the United Kingdom for their wisdom and the power of their fine Military,” Trump tweeted early Saturday. “Good souls will not be humiliated,” Assad tweeted.